Harrod, John EDWARD was born on 4 May 1927 in Hermitage, , Arkansas. He died in Sep 1977. Harrod, married Eula Mae JOHNSON. Eula Mae JOHNSON [Parents]. Eula married Harrod, John EDWARD. NEAL. NEAL married Kristin HOLLINGSWORTH. Kristin HOLLINGSWORTH [Parents]. Kristin married NEAL. Isaac Jackson MALONE was born on 1 Dec 1849 in , , Mississippi. He died on 25 Dec 1928 in , Henderson, Texas. Isaac married Narcissus Sarah Jane "Narry" FORD on 3 Dec 1868 in , Van Zandt, Texas. Narcissus Sarah Jane "Narry" FORD was born on 17 Dec 1857 in , Cherokee, Texas. She died on 16 Jun 1940 in , Henderson, Texas. Narcissus married Isaac Jackson MALONE on 3 Dec 1868 in , Van Zandt, Texas. F i Zilla Victoria MALONE was born on 20 Aug 1873. She died on 31 Jul 1940. Lester Farwell HOLLINGSWORTH [Parents] was born on 5 Jan 1888 in , Vermilion, Illinois. He died on 5 Apr 1973. Lester married Marjorie D. SAVENKER. Marjorie D. SAVENKER was born on 24 Jul 1901 in , , California. She died on 9 Jul 1981 in , Stanislaus, California. Marjorie married Lester Farwell HOLLINGSWORTH. Charles W. MONROE was born in 1883. Charles married Lettie May HOLLINGSWORTH. Lettie May HOLLINGSWORTH [Parents] was born on 5 Sep 1887 in Indian Territory, Bartlesville, Washington, Oklahoma. She died on 2 Oct 1913 in Lewis, Edwards, Kansas. 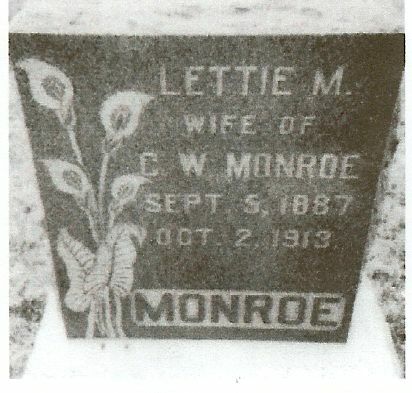 Lettie married Charles W. MONROE. Sampson BROOKS was born in 1800 in , Cullman, Alabama. He died in 1864 in Brevard, Transylvania, North Carolina. Sampson married Malinda LISTER. Malinda LISTER [Parents] was born on 22 Jul 1799 in , Greenville, South Carolina. She died on 23 May 1882 in Brevard, Transylvania, North Carolina. Malinda married Sampson BROOKS. M i Adam Lister BROOKS was born on 24 Aug 1834. He died on 1 Sep 1912. F ii Esther Malinda BROOKS was born in Aug 1837. She died on 8 Nov 1920. Elizabeth BROOKS was born in 1839 in , , South Carolina. Sidney Erwin FORTUNE [Parents] was born on 30 Jun 1852 in Brevard, Transylvania, North Carolina. He died on 12 Aug 1912 in Brevard, Transylvania, North Carolina. Sidney married Mary Elizabeth WILSON on 13 Mar 1884 in Piedmont, Greenville, South Carolina. 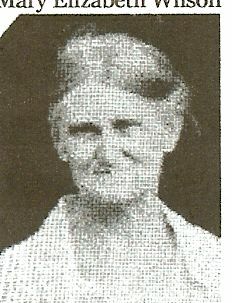 Mary Elizabeth WILSON [Parents] was born on 21 May 1861 in Piedmont, Anderson, South Carolina. She died on 9 Jun 1936 in Brevard, Transylvania, North Carolina. She was buried in Oak Grove Cemetery, Brevard, North Carolina. Mary married Sidney Erwin FORTUNE on 13 Mar 1884 in Piedmont, Greenville, South Carolina. M i William Carew "Willie" FORTUNE was born on 14 Jan 1885. He died on 16 Sep 1966. Claude Erwin FORTUNE was born on 17 Feb 1886 in Brevard, Transylvania, North Carolina. He died on 1 Aug 1961 in Brevard, Transylvania, North Carolina. F iii Esther Talula FORTUNE was born on 10 Sep 1887. She died on 28 Oct 1964. M iv George Washington FORTUNE was born on 17 Aug 1889. He died on 4 Aug 1939. F v Mattie Malinda FORTUNE was born on 18 Mar 1891. She died on 2 Jun 1954. F vi Jennifer Geneva FORTUNE was born on 3 Feb 1893. She died on 19 Jan 1954. F vii Florence Eugenia FORTUNE was born on 19 Sep 1895. She died on 12 Oct 1961. M viii Albert Sidney FORTUNE was born on 26 Nov 1897. He died on 23 Jun 1982. Carl Lavender FORTUNE was born on 26 Jun 1899 in Brevard, Transylvania, North Carolina. He died on 13 Jun 1927. F x Mary Jane FORTUNE was born on 8 May 1901. She died on 7 May 1974. Millie May FORTUNE was born on 28 Aug 1903 in Brevard, Transylvania, North Carolina. She died on 11 Oct 1908 in Brevard, Transylvania, North Carolina. M xii Mitchell Wesley FORTUNE was born on 16 Feb 1906. He died on 16 Jun 1966. William Carew "Willie" FORTUNE [Parents] was born on 14 Jan 1885 in Brevard, Transylvania, North Carolina. He died on 16 Sep 1966 in Brevard, Transylvania, North Carolina. William married Sarah. Sarah was born on 20 Apr 1938. Sarah married William Carew "Willie" FORTUNE. Zeb V. KILPATRICK was born about 1885. Zeb married Esther Talula FORTUNE on 20 Oct 1909. Esther Talula FORTUNE [Parents] was born on 10 Sep 1887 in Brevard, Transylvania, North Carolina. She died on 28 Oct 1964 in Brevard, Transylvania, North Carolina. Esther married Zeb V. KILPATRICK on 20 Oct 1909. George Washington FORTUNE [Parents] was born on 17 Aug 1889 in Brevard, Transylvania, North Carolina. He died on 4 Aug 1939 in , Transylvania, North Carolina. George married Laura Rebecca HUGGINS. Laura Rebecca HUGGINS was born on 7 Mar 1900 in , Henderson, North Carolina. She died on 19 Apr 1979 in , Buncombe, North Carolina. Laura married George Washington FORTUNE.